Today has been one of those days in which I have wanted to throw my laptop out the window numerous times. Even opening a PDF file results in the "rainbow wheel of doom". 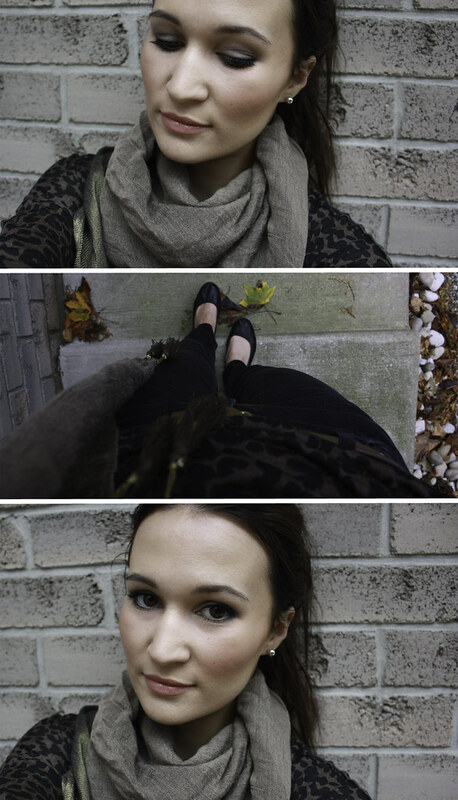 Anyways, when I wasn't cursing at inanimate objects, I did manage to somehow photograph myself stepping out into a beautiful fall day wearing some new pieces I had purchased for the season as well as my new foundation (Chanel Perfection Lumiere - don't know how I feel about it yet). My scarf is from Zara and it has these cute tassels on the corners. The animal print-ish top is from Forever 21, the jeans are 7 for all Mankind (the style is Gwenevere or something like that), flats are by Lanvin and belt from J. Crew. No jewelry aside from simple silver stud earrings. I also didn't carry a handbag because I just haven't been carrying stuff with me lately other than my wallet, phone & keys. Now off to catch up on Gossip Girl - I finished the first episode of the fifth season and is it just me or is their acting even worse than before? Why does Rufus look younger than his son? Am I supposed to really believe the Blair marriage with child storyline? How many cougars will Nate sleep with in his lifetime? Saturday Night Out - outfit & makeup of the day!